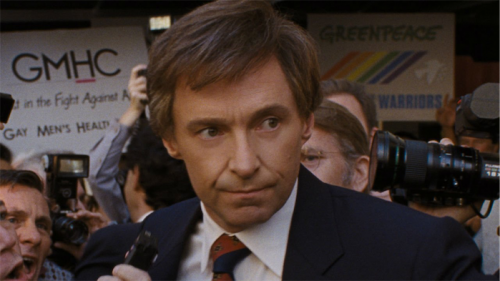 Hugh Jackman as presidential hopeful Gary Hart in “The Front Runner”. IN a week when three movies opening their local seasons tell stories about family issues, the least effective is director Jason Reitman’s filming of Matt Bai’s book about the three weeks when Gary Hart’s bid for Democrat Party nomination in the 1988 Presidential election went pear-shaped. Hugh Jackman is impressive as Hart. Reitman regulars Vera Farmiga as Hart’s wife Lee and JK Simmons as campaign manager Bill Dixon are impressive without being flamboyant. Briton Alfred Molina is “Washington Post” editor Ben Bradlee. But the film’s most influential character is collectively the men and women of the US news media who, for the first time in history, concentrated not on the aspiring candidate’s political platform but on an early morning moment on the steps of Hart’s Washington townhouse, when somebody saw Hart emerging to start the working day and saying goodbye to a handsome young blonde woman who was not his wife. The film gives an impression of too much enjoying remembering the frenzy that followed the story in the “Miami Herald” that swelled to national proportions in print and electronic media, while Hart struggled valiantly to stem the tide by denying that anything untoward had happened, that the woman was an out-of-town member of his campaign team and the media should listen to his policy statements. It is reasonable to ask, what is there about “The Front Runner” that might endear it to filmgoers in this country where political aspirations and shenanigans are swelling around Australian matters? There’s no point in conjecturing how things now might be if Hart had won the nomination and the election. The film’s only currently-relevant message is that the after-hours peccadilloes of men in positions of power have become factors in how they get there and what they do once there. Hart’s marriage survived; the woman in question refused to tell all at the time but late last year announced her intention to write a book about it. A bit late.